SABR sells and distributes Loftware Label Manager (LLM) for Barcode Label printing and RFID encoding. Loftware Label Manager gives you the ability to design and print labels out of the box. The Loftware Label Wizard makes designing labels simple. The first time you open a new label, the Label Wizard prompts you to create a new label, open a compliance label template for custom editing, or open a pre-existing label. Once your label template is open, you can place and size bar codes, text, line, box and graphic fields easily. Loftware Label Manager allows an unlimited number of users to design label formats. Once you've designed your label, you can then print locally, remote across the Internet, or to networks operating in NT 4.0 Terminal Server or Windows 2000/2003 Server (in Terminal Server or Citrix Metaframe environments). One concurrent user license comes standard with each edition, permitting the sharing of up to four (4) barcode or Windows printers on your network. Expand your system as your business grows. The Loftware Label Manager is the basic foundation for all other Loftware products and features a modular design for scalability. As your business grows, you may want to add additional printer seats, or migrate to one of the Loftware's Print Server® solutions to reduce and take advantage of server-centric technology. If so, it is good to know that the Loftware Print Server family of products can utilize your label templates. 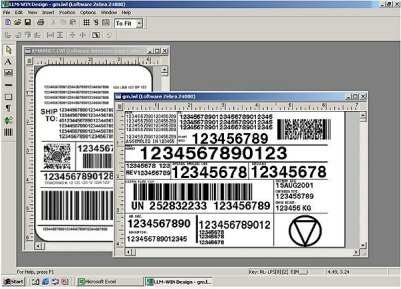 The Loftware Label Wizard has built-in label templates that give you a head start on meeting compliance standards, including label formats for shipping/logistics (UPS's) Compressed MaxiCode Smart Label, FedEx), automotive (Honda, GM's 1724 label), retail (JCPenney, Wal-Mart, K-Mart and More), healthcare (HiBC, UCC), and the telecommunications (TCIF labeling specification). If you need to meet a specific compliance requirement chances are that your industry is on our list of supported symbologies.